Small-scale pond aquaculture has been practiced in various parts of the Lake Tana basin. However, its establishment and expansion have been carried out regardless of the suitability of the locations in terms of land, water, socioeconomic and other inputs available to the aquaculture development. In recent years, there is also an increased demand for aquaculture product, and the government and other private institutions have given much attention to the sector. In response to this need, it is necessary to evaluate the potential sites for aquaculture suitability based on biophysical and socioeconomic indicators. 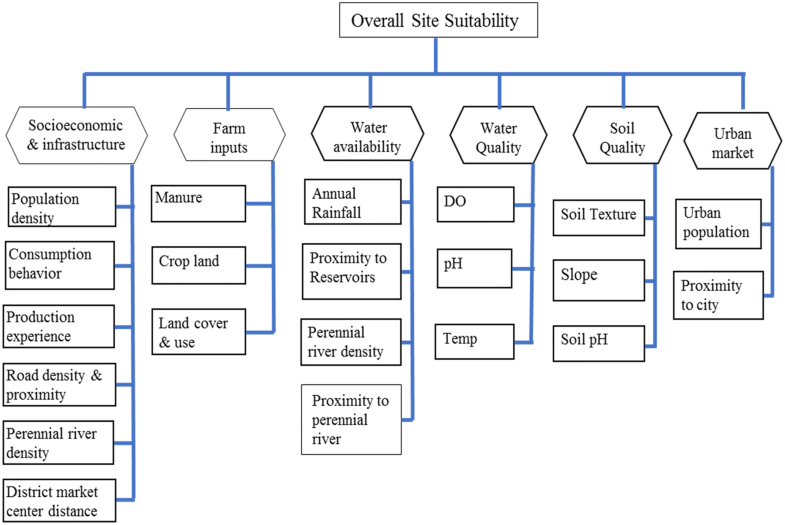 Consequently, GIS-based site suitability analysis was conducted at the basin level to identify and delineate areas, which are suitable for inland pond aquaculture, mainly for Nile Tilapia (Oreochromis niloticus). About 21 criteria, which are sub-grouped into socioeconomic, farm inputs and land use types, water availability, water and soil quality, and urban markets, were considered for aquaculture suitable site-selection analyses. They are converted into various thematic layers. The layers, then combined to develop their respective sub-model suitability maps, which in turn grouped to produce the final overall suitability maps using the weighted linear combination. The relative weights were generated through pairwise comparison by the analytical hierarchy process. The analysis indicates that the prevailing situation in the basin supports promising opportunity for the establishment and development of aquaculture. The GIS evaluation predicts that out of the total land identified for aquaculture site, 32,678.9 ha (2.7%) is highly suitable, whereas 1,166,594.5 ha (97.2%) is moderately suitable for small-scale pond aquaculture system. Similarly, the considerable part of the basin was moderately suitable with a total area of 1,183,253.0 ha (98.6%) and more than 1% (16,768.2 ha) was highly suitable for commercial aquaculture farming. The land area delineated for the marginally suitable category was negligible in both cases. Therefore, the result confirms that the Lake Tana basin has sizeable potential room for aquaculture development at small-scale and commercial production levels. The Lake Tana catchment is the second largest sub-basin in the Blue Nile Basin in the country with an abundance of aquatic resources . The fish from the lake and its tributaries support the livelihoods of many rural people and an important source of animal protein for the poor. However, the fish resources are highly threatened by fishing pressure. The total catches of commercial interest have been seriously declining during the last two decades, particularly the endemic Labeobarbus fish species . Currently, the annual fish catch in the lake is about 10,000t from which Nile tilapia accounted for more than 50% by volume . Nile Tilapia (Oreochromis niloticus) is the most preferred fish by the consumers and become an important commercial fish species in the region with a better market price. This species is widely cultured in Africa and around the world because of its fast growth, and tolerance to a wide range of environmental conditions . The overfishing problem of Lake Tana can be alleviated by introducing alternative livelihoods such as pond aquaculture. Therefore, a great effort is needed to advocate fish biodiversity conservation through developing the aquaculture. Aquaculture is the primary means of achieving an increase in fish supply, which could overcome the steady decline in capture fisheries production. Small-scale pond aquaculture has been practiced in various parts of Amhara Regional State since 2009 . These ponds have an area ranging from 100 to 400 m2. The stocking density practiced by most fish farmers was two Nile tilapia fingerlings/m2. Usually, fish ponds are fertilized with poultry and cattle manure and fishes are also fed with leftover food from the livestock and agriculture . Nevertheless, the establishment and expansion of the small-scale fish farming have been carried out regardless of the suitability of the locations in terms of land, water, socioeconomic and other inputs available to the aquaculture development. For instance, it was observed that some ponds in Amhara Regional State remained unproductive. These are mainly because of the construction of the ponds without adequate consideration of biophysical and socioeconomic assessment. Careful planning is, therefore, necessary to aquaculture development. Thus, the first step for the establishment of pond aquaculture is selecting suitable sites. Prioritizing locations for aquaculture ensures sustainable development, avoids conflict among resource users, minimizes pollution of the environment and ultimately maximizes the profitability of the sector . Geographical information systems (GIS) and remote sensing (RS) are essential tools for the assessment of multiple potential sites in a rapid and systematic way since it combines the spatial data with their attributes and overlays them . Applications of GIS and RS in choosing suitable locations for aquaculture planning and development were demonstrated for various cultures of finfish and shellfish species [7, 9–21]. Strategic fish farming potential assessments using GIS were accomplished in Africa including Ethiopia [9, 22]. The analyses revealed that 29%, 31%, 28% and 12% of the surface area of Ethiopia were classified as very suitable, suitable, moderately suitable and unsuitable for small-scale subsistence fish farming, respectively . Although water was identified as the most limiting factor for inland fish farming , the major sources of water for fishponds in Africa were identified  to be rainfall runoff, perennial rivers, and streams. In Ethiopia, the preliminary site suitability analysis for pond production of Nile Tilapia (Oreochromis niloticus) using GIS was also reported . Water availability, temperature, topography, soil texture, land use and cover, and economic factors were used in this analysis and predicted that highly suitable land for inland pond-based aquaculture to be 15,158 km2. 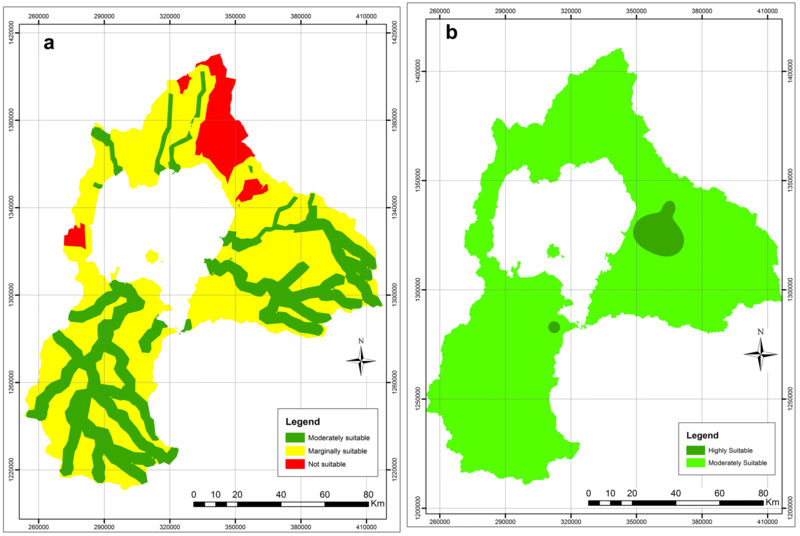 However, GIS and RS for selection of suitable sites for the development of Nile tilapia land-based pond aquaculture have not been analyzed for the Lake Tana basin, which is identified as one of the potential aquaculture areas of the region. The present study has, therefore, made an effort to identify the need for biophysical, socioeconomic and environmental information on aquaculture potential in the Lake Tana basin. It aims to identify potential sites for small-scale and commercial aquaculture development based on the use of GIS models in the Lake Tana basin, using data with higher resolution. The outcomes of the study will facilitate the decision-making process in the allocation of land for commercial fish farming and expanding small-scale household level aquaculture in the Lake Tana region. 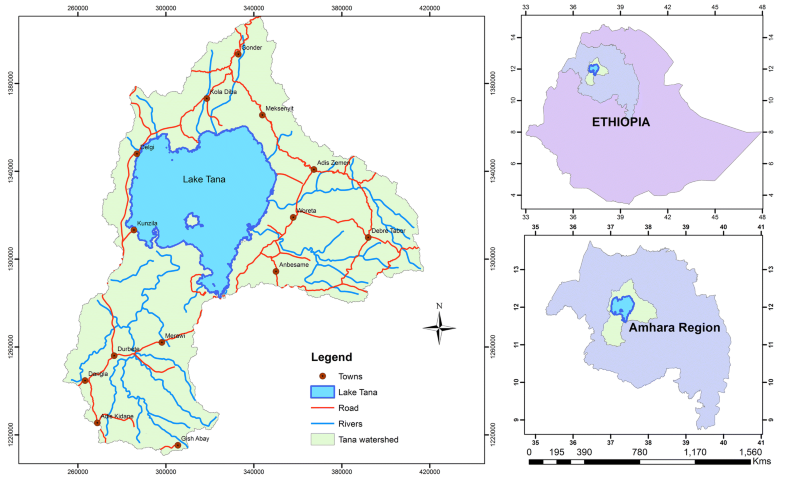 The biophysical and socioeconomic data for mapping aquaculture suitable locations were gathered from the Lake Tana basin in Amhara Regional State, Northwest Ethiopia. The Lake Tana basin is one of the largest watersheds in the Blue Nile basin comprising diverse topography, which occupies an area of 16,500 km2. It lies between 10.95°N and 12.78°N latitude and from 36.89°E to 38.25°E longitude and its altitude ranges from 1660 to 2364 m above sea level (Fig. 1). The basin is rich in water resources encompassing the Blue Heart Lake Tana, many streams and rivers, wetlands and reservoirs. The lake alone accounts for 50% of the country’s freshwater resources and makes it the largest lake in Ethiopia . Seven major rivers and several seasonal streams drain from the upper watershed of the basin and heading into the Lake Tana. The major rivers such as Gilgel Abay, Gumara, Rib, and Megech contribute about 95% of inflow water to the lake , while only the Blue Nile River outflows from Lake Tana. These rivers and streams provide sanctuaries and habitats for various organisms, especially for Labeobarbus fish spawning grounds and very critical for the development of agriculture, hydropower electricity, aquaculture and fisheries. Because of these huge potentials, the basin has been chosen as a growth corridor at the national level since 2012 in order to achieve socioeconomic development within the region . This is a good opportunity for the development of fish farming too. The basin also encompasses extensive wetlands that have been playing an important role in the livelihoods of many rural households. Swamps, floodplains and marshes are the dominant wetland resources within the Lake Tana basin. They provide a natural filter against sediments and pollutants for lake and rivers and serving as habitats for fish spawning, birds, wildlife and plants. The major types of soil in the basin are Luvisols, Vertisols, Nitisols, Leptosols, Gelysolsl and Fluvisols. Vertisols and Fluvisols are available in the land of flat plains and along the rivers . In terms of texture, these soils are heavy clay and sandy loam , which are important for the interest of pond aquaculture establishment. The Lake Tana basin receives an average annual rainfall of 1329 mm. The annual rainfall in the study area ranges from 900 to 2346 mm in a single rainy season, which mostly happens from June to September and also receives minor rain from April to May. The distribution of rainfall is higher in the South and Southeast mountainous side and relatively low in the northern and western parts of the basin. The average air temperature also ranges from 18 to 21 °C, which is high in the northern and western parts of the basin, whereas low temperature in the south and southeast of the study area. The mean monthly sunshine hours of the study area range from 5 to 9.5 h/day, which decreases from May to August and rise from September to January. Wind velocity also ranges from 0.6 to 1.7 m/s, with the strongest winds generally occurring in June, at about 2.0 m/s . The major crops that are grown in the basin covered half a million hectares of land in 2014 . The Lake Tana basin has approximately 10 million livestock population and supports more than 3.5 million people, of which 90% the population lives in the rural area the remaining 10% lives in urban areas in 2007 [27, 28]. The population density is about 228 people/km2, which implies that resources are being severely exploited that in turn leads to eutrophication. This could ultimately cause off-flavor of Nile tilapia, declining of the endemic Labeobarbus fish species, and watershed degradation in the basin [29, 30]. The basin is also coined as a biodiversity hotspot because the lake harbors 15 unique species flock of Labeobarbus, the only remained cyprinid species flock in the world ; Nile Tilapia and African catfish, which are important aquaculture fish species and are widely cultivated in Africa, are inhabiting with good breeding capability. UNESCO has registered Lake Tana as a world biosphere reserve taking into account its fishery potential, harboring unique biodiversity, transportation, and tourism values . This is another opportunity to develop aquaculture as an alternative fishery to improve the livelihoods of fishers and farmers. Primary and secondary data were (biophysical and socioeconomic) collected using social survey, document analyses and field measurements. For laboratory analysis, a total of 34 georeferenced triplicate soil samples were collected from 16 districts of the Lake Tana basin consisting of forest land, wetland, cultivated land, grazing land or farmland. According to the Food and Agriculture Organization (FAO) category , the major soil types identified are Vertisols, Luvisols, Alisols, Fluvisols, Gleysols, Cambisols, Regosols, and leptosols. The soil samples were air-dried and grounded (< 2 mm) for the determination of soil particle size distribution, pH, and electrical conductivity. The particle size distribution was determined by the hydrometer method following pre-treatment with H2O2 to remove organic matter, and the dispersion was aided by sodium hexametaphosphate . Soil pH was measured potentiometrically using Maji multi-parameter (WAGTECH, UK) in supernatant suspension of the soil sample, 1 M KCl and deionized water with a ratio of 1:2.5 . Water quality parameters such as pH, temperature, and dissolved oxygen were measured in situ at the head, middle and mouth of 6 major rivers and 10 streams during the dry season and post rainy seasons using a portable all-in-one meter (Maji multi-parameter, WAGTECH, UK). The population of Lake Tana basin for each district and city administration was obtained from Ethiopian Central Statistical Authority , while the crop cover and livestock populations (cattle, sheep, goats, poultry) were obtained from district administration agriculture offices. The population densities (individual/km2) indicate potential markets of fish and other aquatic products, whereas district capital towns were considered as potential centers for the fish market. The livestock numbers were used as a surrogate measure of manure availability for fish feed and pond fertilization. The total potential available manure was calculated as described by Aguilar-Manjarrez and Nath . The water quality (pH, dissolved oxygen, and temperature) of the Koga reservoir and Lake Tana were obtained from previous reports . The number of fishers obtained from district agriculture offices was considered as a surrogate for factors such as production experience. Annual per capita fish consumption was used to measure the consumption behavior of the districts in the basin. Moreover, water-holding capacity of the soils, sufficient water availability with desirable quality, socioeconomic conditions, infrastructure facilities, and market availability were taken as influential factors for the development of Nile Tilapia (Oreochromis niloticus) farming in the study area. All the data were analyzed using ArcGIS10 for windows, and images were processed by ERDAS Imagine version 9.1 (Environmental Systems Research Institute Inc., USA). The spatial extension module was used for surface interpolation in the ArcGIS. Point data (population, livestock population, temperature, pH, dissolved oxygen, soil texture, crop coverage) were first changed into point shapefiles and then interpolated into a surface using inverse distance weighted tool (IDW) by the ArcGIS. River density was processed using ArcHydro tool in the ArcGIS where the river network and their lengths are determined; afterward, the length was divided by the area within the district possessing the rivers. Proximity (to perennial rivers, to road and access to market center) was mapped using the Euclidian distance tool. For the area land cover, the Jan 2013 image from Landsat 5 was used that had 30 meters ground resolution, and ground truth was brought from the field to classify the image using the ground truth as a signature. Hence, the supervised type of classification of the image in ERDAS IMAGINE software was applied. Slope and elevation data were derived from a digital elevation model (DEM). DEM was taken from open source USGS that had 30 m × 30 m resolution. The DEM directly holds elevation data and then; the slope was processed using a slope tool under the spatial analysis of ArcGIS toolset. All maps and images that were generated in the GIS models were registered on a WGS_1984_UTM_Zone_37N coordinate system in unit kilometers. The overall modeling of suitability was developed using the procedures shown in Fig. 2. Land suitability assessment for aquaculture development is usually based on a number of criteria. In this study, 21 criteria were identified based on data accessibility and relevance within the biophysical and socioeconomic conditions of the study area (Table 1). These criteria were scored for optimal site selection of Nile Tilapia farming by reviewing literature and judgment of aquaculture experts. Consumption behavior and production experience, which were not proposed and used by scholars, were included as important indicators for assessing aquaculture suitability in the study area. These factors were logically classified into six intermediate level sub-models, which includes socioeconomic and infrastructure, farm inputs, water availability, water quality, soil quality, and urban markets. Twenty-one base layers (thematic maps) were prepared for Nile Tilapia farming. Produced maps were awarded a suitability rating according to the land requirements of specified land use functions . The suitability ratings for developing fish farming were classified into four classes; highly suitable (HS), moderately suitable (S), marginally suitable (MS), and unsuitable (US) [22, 37]. The HS level implies that the fish farming is developed at minimum effort or cost, whereas S classification requires modest time and investment. The MS level indicates that substantial intervention on the land is a prerequisite. For the US level, the efforts in terms of the time and cost are too great to be worthwhile for developing fish farming . Each criterion was assigned to a suitability rating by reviewing literatures and consulting expert’s opinions to suit the local environmental condition (Table 1). The criteria were standardized using pairwise comparison technique to make the scores of the criteria compatible . where—λmax is the biggest eigenvalue that can be obtained associated with known eigenvector and n is the number of columns of the matrix A. Allowed inconsistency (10%) can be measured by calculating the consistency ratio (CR), which can be defined as CI/RI, where RI is the random index that depends on the number of elements being compared. If the CI/RI is smaller than 10%, the degree of consistency is satisfactory; if, however, the CI/RI is greater than 10%, there are inconsistencies and the AHP method may not yield meaningful results, which implies that the pairwise comparison matrix procedure should be revised [44, 45]. where Xij is the score of the ith alternative with respect to the jth attribute, and the Wj is the normalized weight, so that ∑Wj = 1. 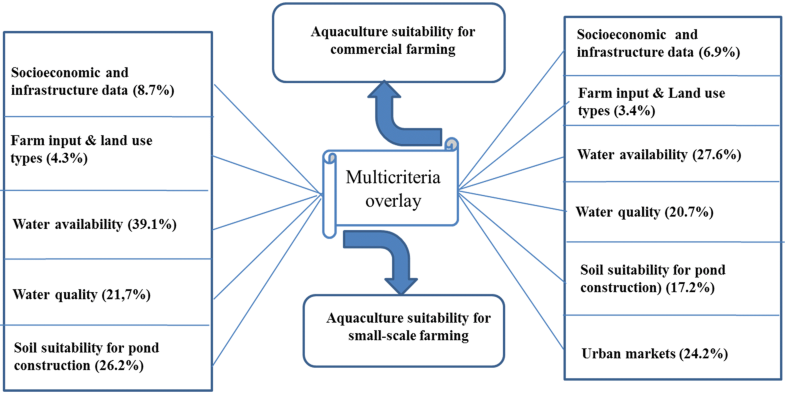 The potential land areas for both small-scale and commercial fish aquaculture production levels were analyzed based on the schematic design of the model scenario shown in Fig. 3. The purpose of small-scale fish farming is assumed to supply food for household consumption to improve food security, and the contribution to the local market is very limited. In this case, only socioeconomic and biophysical factors were analyzed assigning highest relative importance for water availability, water quality and soil quality for pond construction. In commercial fish farming, however, some factors, such as the size of the urban population and city proximity were added assuming that the production needed high market potential for substantial financial return. Criteria weight generated through pairwise comparison matrix are indicated in Tables 2 and 3. They were standardized and scored based on their influence over the success of small-scale and commercial fish farming, mainly for Nile Tilapia in the Lake Tana basin. The consistency ratios (CR) ranged from 0 to 0.02 were within the acceptable inconsistency ratio less than 10% . The outcomes of the sub-models for socioeconomic and infrastructure, farm inputs, water availability, water quality, soil quality, and urban market potential areas (ha) and percentage contribution in four suitable classes, including results of integrated models for both small-scale and commercial farming are summarized in Table 4. Their corresponding suitability maps are illustrated in figures from Figs. 4, 5, 6 and 7. According to socioeconomic and infrastructure classification, only 27.3% (327,705.3 ha) of the land were classified as being highly suitable for fish farming (Table 4). This is mainly linked to low consumption behavior, poor production experience, and long distance to travel toward the district market center. Nearly 50% of the land was unsuitable due to limited access to the district market center for the development of fish farming in the study area. Well accessible transportation facilities, including all-weather roads and well-established marketing facilities are significant to the local community for developing a network with linked industries for tilapia farming . On the other hand, population density (64.5% highly suitable) and road proximity (98.8% highly suitable) were in favor of fish farming development within the study area. In general, significant parts of the basin (about 66.9%) were put under a moderately suitable category, and no unsuitable lands were found for Nile tilapia aquaculture in terms of socioeconomic and infrastructure factors (Fig. 4a). Based on the farm input and the land uses classification (Additional file 1:Table S1 and Additional file 2: Fig.S1), 657,983.4 ha (54.8%) and 542,037.5 ha (45.2%) of the potential areas were identified as highly suitable and moderately suitable, respectively. Manure production from livestock also showed 100% highly suitable. The contribution of the total manure from the livestock population in the basin was significant to those potential results. About 652,448.0 ha (54.4%) cultivated land, which could produce more than 80 quintals/km2, was highly suitable, whereas 539,139.6 ha (50%) of the area was classified as being marginally suitable, and 8433.7 ha (0.7%) were classified as moderately suitable to access crop by-products for fish feed and fertilizing the pond (Fig. 4b). The livelihoods of the majority of the population in the basin primarily depend on agriculture. Therefore, agricultural by-products such as livestock waste and crop litter can be used both as sources of feed for fish and fertilizer for fish ponds . Adding livestock waste to fish ponds induces the blooming of phytoplankton that serves as a primary food for the fish. Adequate water source is also an essential element for identifying areas to establish fish farming. The water availability of the Lake Tana basin is highly dependent on rainfall availability as compared to perennial rivers, lakes and reservoirs. Significant parts of the study area in the south and east were classified as moderately suitable, whereas the northern and western parts were categorized into marginally suitable areas. On the basis of annual rainfall, approximately 70% of the area was highly suitable and there was no area found unsuitable. This confirms that a critical moisture deficit in the basin is not a problem (Table 4). On the other hand, based on perennial rivers, 1,067,649.74 ha (89%) of the area were classified under marginally suitable condition. The northern and northeastern parts of the study area, namely, Gondar Zuria, Wegera, Alefa and Lay Armachiho districts had very few perennial rivers and received marginally suitable ailment. Likewise, 587,127.3 ha (50%) of the area was found unsuitable because of long distance to the rivers. Only 22% of the land was classified as being moderately suitable, whereas 16% and 13% classified as highly suitable and marginally suitable, respectively. Accesses to lake and reservoir waters were also difficult in the study area, as the majority parts of the land (87%) were classified under unsuitable condition. In the basin, over 60,000 ha land is planned for irrigation development and of this 6000 ha for “Koga” irrigation project is already completed [1, 24]. This can provide an enormous opportunity for the development of sustainable land-based aquaculture. The integration of rice cultivation with the existing cropping systems in the northeastern parts of the basin, particularly in “Fogera” flood plains will also create opportunity in introducing small-scale fish farming. Overall, highly suitable area for water availability accounted for 33.5% of the basin’s land area, whereas 58.6% and 7.9% were belonged to moderately suitable and marginally suitable classes, respectively, and there were no unsuitable areas. Good water quality, which is characterized by well-oxygenated, pollution free, favorable temperature and pH, provides an optimum condition for the growth of fish in a pond. The pH value within the range of 6.5–9.0 is suitable for fish farming, if it is below 4 or greater than 11, the fish will not alive (Boyd and Tucker 1998). Based on the water temperature parameter, 95.4% (1,434,139.9 ha) was moderately suitable and 76.4% (1,149,109.1 ha) of areas within the basin is classified as moderate conditions for fish growth in terms of dissolved oxygen parameter. Water temperature and dissolved oxygen critically limit the growth of fish and should be seriously considered during the establishment of fish farming [40, 47]. No areas were found unsuitable in terms of both water temperature and dissolved oxygen. With regard to temperature, highly suitable areas are located in some relatively flat areas, such as Fogera plain. In general, water quality for fish farming in the basin is classified as moderately suitable. Soil characteristics such as, texture, organic matter content, pH, clay content, are also another important factor to be considered while selecting sites for establishing an aquaculture venture. Soil suitability analysis in terms of texture indicated that 64% (763,364.8 ha) of the basin is highly suitable; 26% (310,541.1 ha) is moderately suitable; 8% (99,842.2 ha) marginally suitable and the rest 2% (26,273.3 ha) is unsuitable. The north and northeastern parts of the basin are highly suitable, whereas greater parts of the southern and eastern of the basin are moderately and marginally suitable (Fig. 6a). According to previous study , Vertisols and Fluvisols are the most common soil types available in the land of flat plains and along the river banks of the basin. In terms of texture, these soils are heavy clay and sandy loam, which are suitable for the use of pond aquaculture. The majority (73%) part within the area was also classified as moderately suitable with regard to soil pH, but most of the northern parts of the basin were highly suitable (Fig. 6a). In the study area, soil suitability for pond construction was limited by topography (slope) of the land. Evidently, slope classification shows that nearly 41% of the land was categorized as unsuitable conditions. Topography highly determines pond design and farm layout. A terrain with a slope between 2 and 4% is ideal as this feature allows the filling and draining of ponds by simple means of gravity . Accordingly, the building of a fish pond on a steeper land is a very expensive business in terms of construction and water pumping cost. 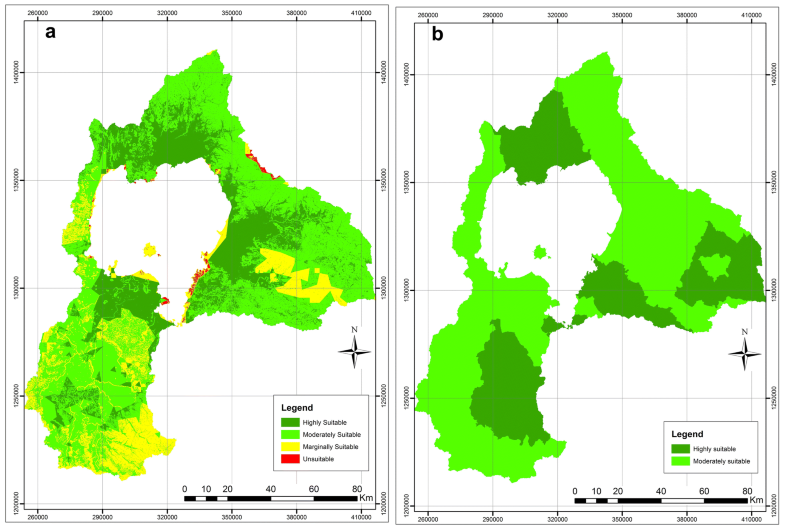 The areas surrounding Lake Tana were found highly suitable and the up-streams of the basin were unsuitable according to slope classification. Weighted overlay of the final overall soil suitability (Fig. 6a) revealed that more than 661,935.4 ha (50%) of the area was moderately suitable with the slope being the most limiting land characteristics. Critical evaluation of potential fish market availability is the key issue for the viability of aquaculture operation. Thus, the urban market potential is one of the most important factors that should be considered for the development of commercial farming in Africa . In this study, market potential was inferred from the proximity of cities in each district and the capital town besides to city resident population densities. On the basis of market proximity, 100% of the Tana basin was highly suitable since all the sites are within 165 km radii of the district towns that are considered to be important markets for commercial fish. On the other hand, the GIS classification of the population data showed that of the area 34% (407,851.1 ha) and 66% (792,170.2 ha) of the area were moderately suitable and marginally suitable, respectively. The derived weights were used to integrate the sub-models, and their maps are shown in Fig. 7a, b. Accordingly, the overall evaluation indicated that 97% (1,166,594.5 ha) of the area of the basin was found to be moderately suitable for small-scale fish farming. The remaining 3% (32,678.9 ha) of land was highly suitable. Negligible land in the area (0.1%) was marginally suitable. No land was identified as unsuitable for subsistence aquaculture. As shown in Fig. 7a, the land in the category of highly suitable for small-scale aquaculture was found in the Northeast and Southern parts of the lake, where most of the requirements overlapped each other in a conducive manner for the category they are assigned. The area identified as highly suitable for commercial farming (Fig. 7b) is dropped by 50% as compared to small-scale fish farming. The difference may be mainly related to marketing indicators. The majority of the area (1,183,253.0 ha) in the basin was found to be moderately suitable for commercial fish farming, which is a little larger than small-scale farming. Poor infrastructure development and low population density in some parts of the basin may influence biophysical and socioeconomic suitability for commencing commercial fish farming. Therefore, implementing commercial farming in these areas requires more investment in infrastructure development. By introducing mitigation measures for some of the land quality limitations and designing appropriate management strategies, it is possible to use unsuitable areas for the development of aquaculture . 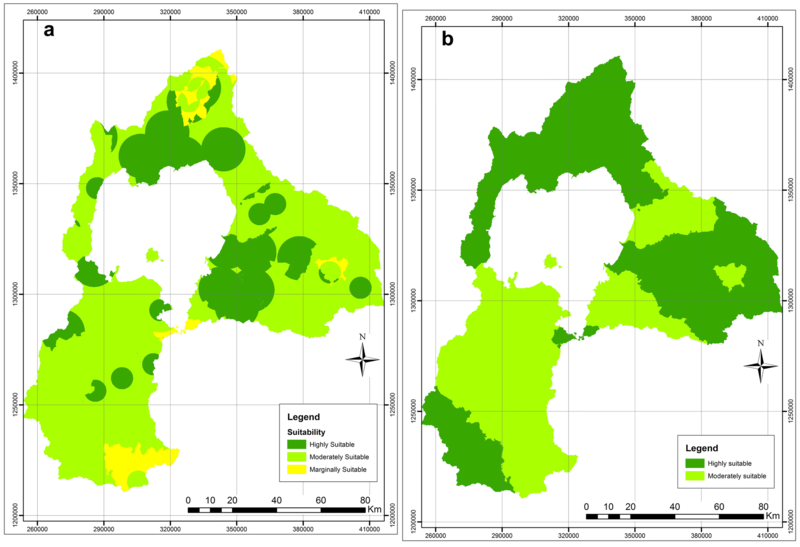 In this study, the potential of small-scale and commercial aquaculture in the Lake Tana basin based on identified 21 biophysical and socioeconomic determinant factors was evaluated using GIS modeling. The result confirms that the prevailing situation in the basin supports promising opportunity for the establishment and development of aquaculture. The GIS evaluation predicts that from the total area of the basin, 32,678.9 ha (2.7%) and 1,166,594.5 ha (97.2%) were highly suitable and moderately suitable, respectively, for small-scale pond aquaculture system. The area delineated as marginally suitable category was negligible. Similar to small-scale aquaculture, a considerable area of (98.6% or 1,183,253.0 ha) the basin was moderately suitable and very small area (1.4% or 16,768.2 ha) was highly suitable for commercial aquaculture. Therefore, it can be concluded that the Lake Tana basin has a sizeable potential for aquaculture at small-scale and commercial production levels. The most limiting factor for the establishment and development of aquaculture at the basin level are limited fish production experience, inadequate water access to rivers, and sloppiness of the land. Wise use of water from rainfall runoff can be a sufficient source of water for small-scale fish farming. The groundwater should also be considered as an alternative source for commercial fish farming. Commercial fish farming in the region is also limited by population densities, which is the proxy of market potential. This problem can be ameliorated selling aquaculture products to Addis Ababa and emerging cities as the demand fish is ever increasing in the peri-urban and urban markets despite the supply from the capture fishery is decreasing. Production experience related to fish farming is also found to be an obstacle to harness the potential of aquaculture in the basin. Therefore, there is a need to provide guidelines and trainings for small-scale community-based aquacultures. Models used to analyze the suitability in this study can be used to scale up the aquaculture development at the household level as well as commercial level. Based on the result of the analysis, the huge potential of the Lake Tana basin for fish farming has to be changed into reality; thereby, it can contribute more toward improving food insecurity in the region. Finally, the GIS modeling that was used in this study was a powerful tool for identifying the suitability of potential lands for the development of aquaculture ventures at the small-scale and commercial level in the Lake Tana basin. It provides useful data for policy makers and decision-makers to frame strategies for promoting aquaculture. WWA conceived and designed the study, organized the field work for data collection, organized soil laboratory analysis, data analysis and writing of the manuscript; WBA was involved in data collection, analysis and GIS mapping. Both authors reviewed and edited the final manuscript for submission. Both authors read and approved the final manuscript. The authors wish to thank agricultural offices for offering secondary data and facilitating field data collection during a sampling campaign. Blue Nile Water Institute of Bahir Dar University greatly acknowledged for supplying logistic support. We also thank Dr Belachew Getnet and Zebasil Tasew for providing helpful comments on the earlier version of the manuscript. All data underlying the findings in the study are freely available upon requesting the authors via Blue Nile Water Institute of Bahir Dar University, Ethiopia, at http://www.bdu.edu.et/bnwi/. This research project was commenced after obtaining ethical clearance from the research ethics review committee of the Blue Nile Water Institute of Bahir Dar University. Moreover, informed consent forms were distributed to research participants and then consent agreement signed with respondents. Data collected from each respondent was kept confidential. This work was financially supported by the Blue Nile Water Institute through Bahir Dar University, Ethiopia. The funder had no role in the study design, data collection and analysis, decision to publish, or preparation of the manuscript. 40066_2018_222_MOESM1_ESM.docx Additional file 1: Table S1. Existing land use and land cover classification results for Lake Tana basin. 40066_2018_222_MOESM2_ESM.tif Additional file 2: Fig. S1. 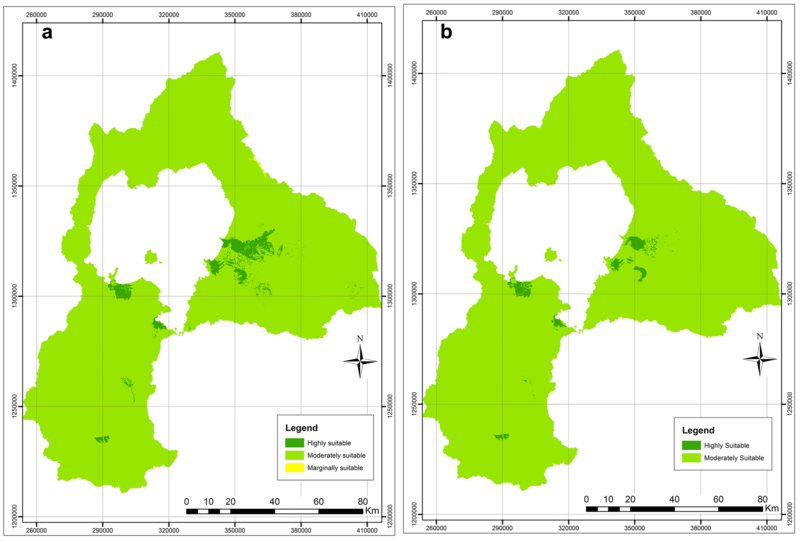 Existing land use and land cover of Lake Tana basin. Awulachew SB, Erkossa T, Smakhtin V, Fernando A. Improved water and land management in the Ethiopian highlands: its impact on downstream stakeholders dependent on the Blue Nile. In: Intermediate results dissemination workshop held at the international livestock research institute (ILRI), Addis Ababa, Ethiopia, 5–6 February 2009. International Water Management Institute. https://doi.org/10.3910/2009.201. National Meteorogy Agency of Ethiopia (NMA). Bahir Dar Meteorological Branch, Bahir Dar, Ethiopia; 2014. http://www.ethiomet.gov.et/. Bureau of Agriculture (BoA). Amhara National Regional State, Bureau of Agriculture, Bahir Dar, Ethiopia; 2014. http://www.amhboard.gov.et/.